The society is collecting information on veterans from the local area and would like YOUR input. If you served your country or have a loved one who did, please tell us. This database will prove invaluable to future researchers and will leave a lasting record of Wyoming County’s many loyal veterans. We are currently concentrating on World War I and World War II veterans, but we welcome data from any and all persons who served in the Armed Forces. You may download our form in either PDF format or plain text format, and mail it back to the society at the address on the form, or fill out our form online. We are collecting information for the Wyoming County Historical Society records. 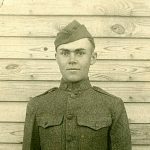 We are currently working on World War I & II soldiers but we are also collecting information on all soldiers who have served in the Armed Forces, who have lived in the Wyoming County area or who have since moved into the Wyoming County area. Also any relatives that you know may have served would be appreciated. THANK YOU! Please include maiden names and nicknames. Please include mother's maiden name. Please add any stories or tales that you would like to relate so we can better understand what you went through, who you served under or who you served with. (We are not concerned about spelling or grammar.) This is your page and it will be put into the archives at the Society. WE WOULD, AT THIS TIME, THANK YOU FOR YOUR PATRIOTISM AND FOR PROVIDING US WITH THE FREEDOM WE HAVE TODAY.